It was in the USSR in 1984 that Tetris came into being. It was created by computer engineer Alexey Pajitnov on the Elektronika 60 while he was working for the Moscow Academy of Sciences. The name was derived from the Greek word 'Tetra' which means 'four' and tennis, Alexey's favourite game. Tetra, of course, referred to the fact that all of the game's pieces were tetrominoes, consisting of four segments. The game was an instant success and was freely distributed across the Eastern Bloc and USSR, made easier by its port to the IBM PC in 1985. 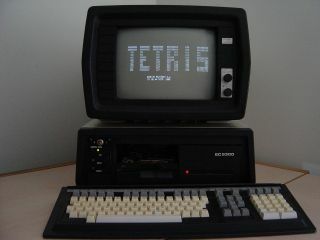 In the late 1980s Tetris launched on PCs in North America and Europe and was discovered by game publisher Henk Rogers at a Las Vegas trade show. He knew it would be a hit and released it on the PC and NES in Japan. It became one of the first ever software blockbusters, selling over two million copies in 1988 alone. 1989 saw Tetris explode onto the scene. Henk Rogers secured the handheld rights to the game and licensed them to Nintendo. The latter swiftly included it in their launch package of the Game Boy platform and over 35 million copies have been sold. Even Alexey was addicted to his own masterpiece: "Yes, I am [addicted]. Not as much as I was at the beginning but I still play with great pleasure. I think I've put more than 1000 hours into playing the game for the past 25 years." You'd think that after all this hype and excitement that Alexey would be rolling in the money but he didn't own the rights to his own masterpiece. The government claimed these under the USSR copyright law at the time, as he was a government employee, and formed an organisation known as Elektronorgtechnica (Elorg) to harvest the monies from worldwide distribution rights. However, other companies had taken the rights for themselves, without approval from either the USSR or Pajitnov, and a legal battle between Nintendo and Atari wasn't clearing the waters much either. In short, it was a right mess. In 1996 the rights to the game reverted back to Alexey and he formed the Tetris Company along with Henk Rogers. The Tetris Company became the exclusive source of all quality Tetris licenses and has grown from strength to strength ever since. Today Alexey Pajitnov is announcing to the world that Tetris has just surpassed 100 million mobile paid downloads. When asked how he feels about this impressive achievement he says: "It's great! Tetris is the only mobile game to reach the 100 million paid download milestone and more people are playing my game now than throughout the entire history of the game! I believe historians of the mobile industry will appreciate this milestone in the future." Certainly the figures have long since agreed, according to the Apple iTunes Store Tetris has been ranked as one of the all time top 10 paid applications for a while now. "I think it's an indicator that casual gaming is now 'fully blossoming' and finding its way to the hearts of millions through their mobile phones," says Pajitnov. So why is Tetris so popular? Why has it endured for so long? When asked this very question its creator says, "[Tetris] is very casual but very challenging and fits perfectly to such small devices as cell phones. This game makes me feel quick and smart and I like that about it. I hope that the other players feel the same way."